The temperatures are high and summer is calling for cool drinks to keep things fresh. Here are some summer sips to keep things cool! Check out the mocktail and cocktail alternative ideas after each recipe. Ginger Simple Syrup Directions: Combine 1/2 cup water, 1/2 cup sugar, and one 4-inch piece of ginger cut into 1/4-inch pieces in a small saucepan over high heat. Bring to a boil, then reduce heat to a simmer until sugar dissolves completely, about five minutes. Allow to cool completely, then strain before using. Mocktail Alternative: Substitute beer for non-alcoholic beer or ginger ale. Place ice cubes, vanilla ice cream, vanilla flavored vodka and orange juice in a blender and blend well. Pour 3/4 full into serving glass. Equally top each glass with orange soda. Dip orange slices in sugar and place on rim of glass for garnish. Stir all ingredients together in a pitcher. Serve immediately over ice. Garnish with lemon wedges and cherries. Mocktail Alternative: Eliminate vodka and substitute beer with non-alchoholic beer or ginger ale. Bring the water and sugar to a boil over high heat just until sugar dissolves. Crush the sage leaves with the back of a spoon and add to the syrup mixture, then set aside to let the sage infuse for 15 minutes. Remove herbs. Puree the blackberries in the blender and then strain the mixture through a fine strainer. 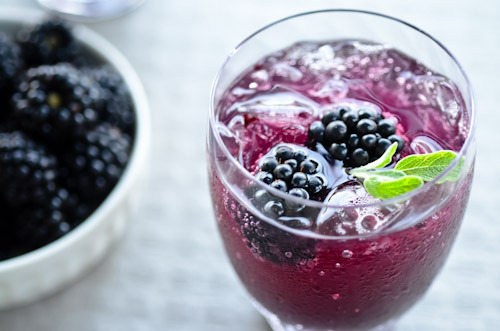 To serve, place a tablespoon of the blackberry puree in the bottom of a glass, add a tablespoon of the sage syrup, and top off with 8 ounces of club soda. Cocktail Alternative: Add one ounce of rum to each glass. Muddle watermelon with cilantro leaves. Add ice, simple syrup, and tequila. Shake vigorously and pour all contents into a rocks glass. Garnish with a piece of watermelon in a bamboo spike and squeeze of lime. Wash and slice the fruit, layering and arranging them in a large pitcher. Pour the orange juice and wine over the fruit and gently stir. Add sugar according to taste. Chill the sangria in the fridge until you’re ready to serve it. Right before, pour the club soda over the top, give it a mix, and enjoy. Mocktail Alternative: Substitute white grape juice instead of white wine. So many great ideas for summer parties with friends! ← Mrs. Fields Trivia is HERE – Win FREE COOKIES!